Residents of Russia’s far-eastern island of Sakhalin are outraged by Moscow’s abrupt decision to take away regional budget revenues. Activists are collecting signatures in the Cheknhov square in Yuzhno-Sakhalinsk. Photo courtesy of Ksenia Semenova. Some rights reserved.This article originally appeared in Russian on MediaZona. The Russian government’s draft federal budget for 2018 came as an unpleasant surprise for Sakhalin oblast, Russia’s only island region. Officials have proposed redistributing half of the Sakhalin-2 oil-and-gas project’s contributions from the regional budget to the federal one. Local authorities see this as nothing short of catastrophic and complain that they were never notified of Moscow’s plans. In response, activists have been collecting thousands of signatures and are organising a rally to protest the proposal. “Since 2015, the government’s economic policy (and budget policy as an integral component thereof) has been geared towards negotiating the consequences of the largest external shock of the past half-century.” These are the opening words of the explanatory note to Russia’s draft federal budget for 2018 and the 2019-2020 planning period. The word “stability” appears four times in the introduction, but in fact it is this document that has served to destabilise the situation in Sakhalin Oblast — and to do it sharply. The draft bill appeared on the State Duma website on 29 September. It referred to an “additional transfer to the federal budget of 50% of the profit tax, with the subsequent redistribution of corresponding additional revenues towards the development of the Far Eastern Federal District.” This means that if the region currently receives 75% of tax revenues from the project, with the remaining 25% going to the federal budget, the opposite will soon be the case: 25% for the region versus 75% for the government. According to the explanatory note, a redistribution of 33.7 billion roubles (£444m) has been proposed for next year (the total income of Sakhalin Oblast being some 100 billion roubles). This isn’t the first attempt to seize revenues from Sakhalin-2. Until last year, 80% of the profit tax went to Sakhalin Oblast; towards the end of the year, however, the government took 5% to support other regions. 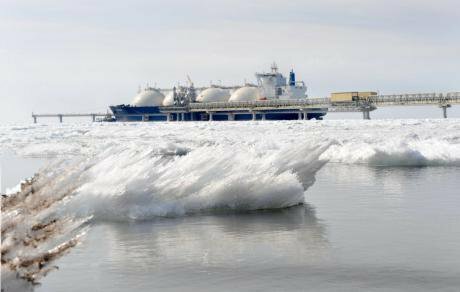 The Sakhalin-2 LNG plant is the first of its kind in Russia. Source: www.shell.com. All rights reserved.Gazeta.ru’s government sources contend that Yuri Trutnev, the president’s representative in the Far East, instructed the Ministry of Finance to transfer the Sakhalin contributions to the Development Fund of the Far East and the Baikal Region. It is alleged, however, that a different plan was originally discussed in government, and which involved funnelling this money into the budget in exchange for subsidies from Moscow. According to RBC sources, the redistribution initiative originated from the Ministry for the Development of the Far East and was supported by Trutnev. Furthermore, it had allegedly already been given the green light by President Vladimir Putin. Representatives from Sakhalin Oblast strongly opposed the initiative, but unsuccessfully so. Yuri Trutnev is rather well acquainted with the Sakhalin-2 project: at the peak of the conflict between the Russian authorities and an international consortium of developers in 2006, he held the post of Minister of Natural Resources and personally revoked the decree that approved the findings of the project’s environmental impact assessment. As a result, the conflict led to a change of ownership: Gazprom bought a controlling stake (50% plus one share) from Shell and the Japanese companies Mitsui and Mitsubishi. Reports of the imminent budget redistribution first emerged on September 28: an article in the Oil and Capital magazine was followed by articles in RBC and other business publications. Ksenia Semyonova, editor-in-chief of Sakh.com, Sakhalin’s largest media outlet, said in an interview with MediaZona that she’d found out the news from a source only a little earlier and didn’t have time to publish any original material. According to Semyonova, such initiatives had never previously been so much as rumoured on Sakhalin. “The elections went wonderfully well for United Russia,” says Semyonova, “all the right people got elected, nothing augured any misfortune. The budget had already been drawn up with the proper indicators and forecasts [at the current level of funding]. And now they tell us we’ll have 30 billion less. I can just imagine our finance minister’s face. I’m not a particular fan of the authorities, but I can understand very well on a human level how they must have collected the regions’ budget wants, coordinated state programmes — it’s all monstrously complicated.” Semyonova noted that the bill is set to receive its first Duma reading only on 27 October, and that the region won’t be able to work on a new budget in the interim. 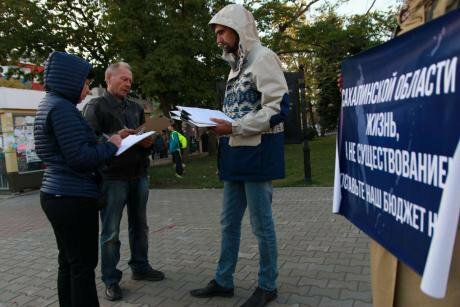 During the picket, activists managed to collect over 17,000 signatures for a petition imploring President Vladimir Putin “to intervene in the revenue redistribution process” and not to deny “Sakhalinites and Kuril Islanders the opportunity to develop their islands and live in dignity”. The petition was due to be sent to Putin as early as 4 October, but “prominent people from Moscow” advised choosing an individual respected throughout the region to act as envoy. A candidate for the job didn’t take long to find — Nivkh writer Vladimir Sangi became flag-bearer. He signed the petition, and the document was delivered by car from the settlement of Nogliki, located over 600km north of Yuzhno-Sakhalinsk. On Thursday, Semyonova sent off to Moscow a parcel full of petition forms. Total weight? Seven kilos. The electronic version (a full three gigabytes) was sent to Putin via the Kremlin’s official website. Semyonova adds that, with the petition dispatched, Sakhalin activists are now discussing the holding of a rally that would “consolidate” the results. “Why is it that we’re writing to Putin? I believe Russia needs a tsar or lord who’d come and hear us out, take action, help us. We’re counting on nothing else,” says the journalist. 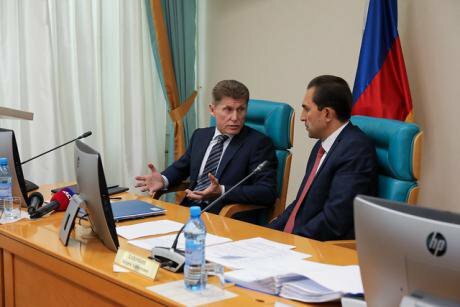 On the evening of 29 September, Sakhalin Oblast governor Oleg Kozhemyako warned in an interview with Sakh.com of the “catastrophic consequences” that a revenue redistribution would bring about. “Any oil-and-gas ventures on Sakhalin must first and foremost benefit the economy and social well-being of Sakhalin Oblast residents,” said the governor. “People waited many years for these ventures to start generating returns before this finally happened. Oil-and-gas revenues began to be invested into the development of the region, into new projects aimed at improving the quality of people’s lives. We’ve only just begun reaping the first genuinely tangible benefits of these investments. And all these efforts are now in jeopardy.” The governor noted, furthermore, that the decision was made “without taking the region’s opinion into account” — the Sakhalin authorities “were not informed”. Governor Oleg Kozhemyako and the newly-elected chairman of the Sakhalin Oblast Duma Andrei Khapochkin. Photo: Press center of the Sakhalin regional Duma. All rights reserved.When the “conjectures” were confirmed, the Oblast Duma began formulating an appeal to State Duma Speaker Vyacheslav Volodin that was finalised only today, while the SakhalinMedia website promptly launched a hashtag campaign called #OilandGasDekulakisation. In their letter to Volodin, the Oblast Duma deputies emphasise that the initiative has met with “a negative public reception” and that it “could undermine Sakhalinites’ confidence in the organs of state power.” They explain that work on the Sakhalin-1 and 2 projects began back in 1990s, but that the companies were initially exempted from paying taxes and fees to the regional budget with an eye towards future profits. Principal revenues from offshore projects began to arrive in 2012, but have already led to a marked increase in living standards. Meanwhile, in excess of 30 billion roubles will need to be spent over the course of three years on moving people out of dilapidated and substandard housing; the region intends to carry out a gasification of housing stock (today, a mere 13% of households in this so-called oil-and-gas hub are connected to gas pipelines, as compared to 66% across Russia as a whole) as well as undertaking large-scale repairs of the electrical power supply system. The deputies estimate budget losses of some 40 billion roubles — an amount comparable to the volume of all financial assistance to municipal budgets. “The country’s top brass sets the objective of regional development – only for the Ministry of Finance to turn a blind eye to this without giving a moment’s thought to the social and geopolitical ramifications of such a step,” argues Mikhail Yemelyanov (A Just Russia), first deputy chairman of the State Duma Committee for Economic Policy. “The Ministry of Finance is essentially trying to rob the region while leaving interest groups well alone. Nothing good will come of this as far as the country is concerned.” Federation Council Chair Valentina Matvienko criticised the draft federal budget in more general terms, noting that strictly locking in expenditure under conditions of “sluggish stability” isn’t enough. No response to these developments was forthcoming from Sakhalin Oblast senator Dmitry Mezentsev — MediaZona was informed by his office that Mezentsev was busy preparing for the anniversary of the Russia-China Friendship Association, of which he is chair. The senator’s representative failed to call back following a request for comment. An enquiry addressed to the Sakhalin Gubernatorial Administration has yet to receive a response. Further note: The Sakhalin-2 oil-and-gas project is being developed on the island’s north-eastern coast under the terms of a production sharing agreement between the investor and the state. The project, operated by Sakhalin Energy, involves the development of the Piltun-Astokhskoye oil field and the Lunskoye gas field as well as the construction of a plant for the production of liquefied natural gas. Under the production sharing agreement (PSA), the state grants the investor the right to mine, and the latter undertakes to carry out the mining using its own resources. The agreement, signed in 1994, was the first of its kind in Russia. The Sakhalin Energy website states that the PSA provides for a special tax regime: instead of paying VAT, mineral taxes and other charges, Sakhalin Energy must pay 6% of royalties (periodic payment in specie). After the company has successfully recouped the production commencement costs, it pays profit tax at a rate of 32% and transfers to the state a percentage of the natural gas it has produced. Sources within the company note that in excess of $5 billion has already been paid to the Russian state.